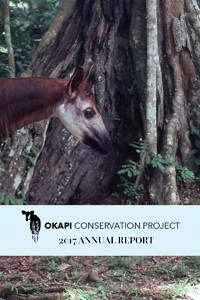 White Oak Conservation Center and the Jacksonville Zoo recently hosted the international meeting of the Okapi SSP and EEP. Participants from zoos in the US, Europe and Japan traveled to Jacksonville to discuss okapi management in zoos and to coordinate support for the Okapi Conservation Project. Okapi Wildlife Reserve ICCN Director JJ Mapilanga also participated and provided the group with an update on the current status of the Okapi Wildlife Reserve and the challenges of okapi and wildlife conservation in the DR Congo. Mr. Mapilanga enjoyed spending time at White Oak Conservation Center and meeting with all the attendees. Many zoos which hold okapi were present at the meeting, and we anticipate working more closely together to support the important work of Mr. Mapilanga and his forest rangers to protect the okapi and its Ituri Forest home.